President of Port Harcourt Chamber of Commerce, Engr. Emeka Unachukwu has said the 9th edition of Port Harcourt International Trade Fairs will continue to remain a strategic meeting point for global brands. The president who made this assertion during a brief with PHCCIMA media on the upcoming eagerly awaited 9th edition of Port Harcourt International Trade fair, gave strong assurances that this year's fair will not only break all known records of previous fairs but will open vistas of opportunities like never before. In a statement earlier made available to press by the President, it reads: “Distinguished ladies and gentlemen, let me on behalf of the Executive, Council and entire membership of Port Harcourt Chamber of Commerce, industry, mines and Agriculture (PHCCIMA) welcome you to the 9th edition of Port Harcourt International Trade Fair. I note with pride, the great transformation that has characterized our trade fair, from an ordinary assembly of traders, herbalists and small scale farmers to a world class meeting of global brands in a revitalized meeting that has become an international trade fair”. He stated that the development underlines the recognition of trade as a key driver for economic growth in our nation and a move towards realization of Nigeria's vision 2020 project. Unachukwu noted that Port Harcourt International Trade Fair has been a major catalyst in the development of our domestic trade and pivotal in promoting international trade which consequently helps in fostering important international trade relations. The PHCCIMA helmsman noted that the fair has witnessed consistent upgrade in the quality of planning and organization to match international standard and this he said includes the provision of free health care and emergency medical services, presence of fire fighting personnel, and highly improved security set up at the trade fair ground. More critical in this year's fair he said includes introduction of compulsory insurance in partnership with NEM insurance company to all participants to boost their confidence and allay any fears of participating in the trade fair. Similar he said the uniqueness of Port Harcourt International Trade fair lies in the supporting programmes that spice the entire event. Hear him: “We have improved our regular brand and stars concert, this year we shall be featuring the best of Nigerian musical acts making huge impact with their music and comedy”. He expressed gratitude to all exhibitors and sponsors who have remained faithful to the Port Harcourt International Trade Fair by supporting its growth through regular participation among others over the years. 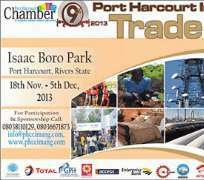 The 9th edition of port Harcourt International Trade Fair is expected to kick off on the 18thof November through the 5th of December at the usual Isaac Boro Park.